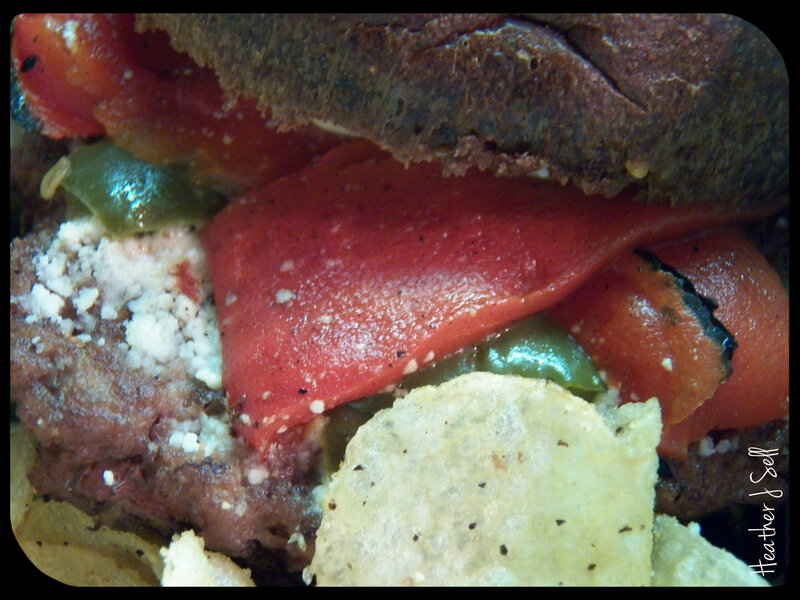 How about a Thunder Steak Sandwich or a Cooper’s Candied Burger? 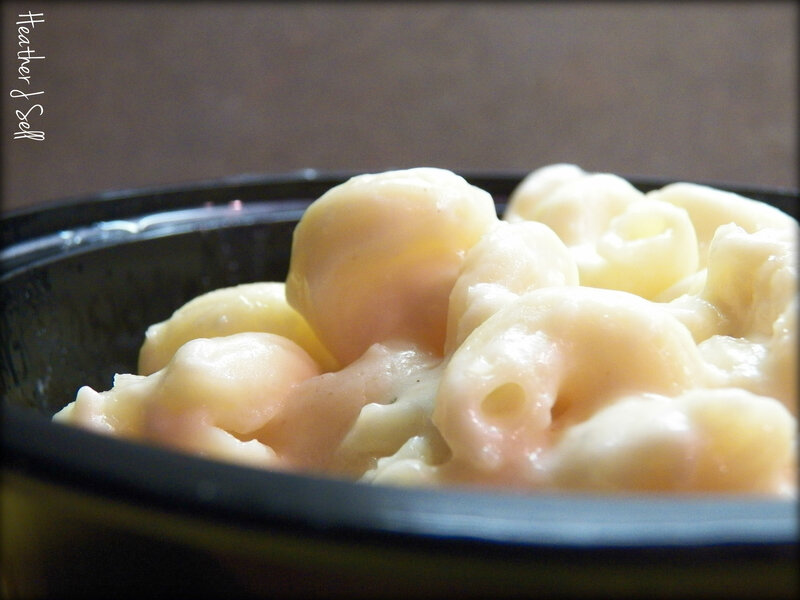 Tempting your taste buds? It did mine! When I received the invite to check out the Give & Grub Food Truck and sample a few of their tasty wares, I was without-a-doubt lured by the promise of scrumptious treats linked with a noble cause. 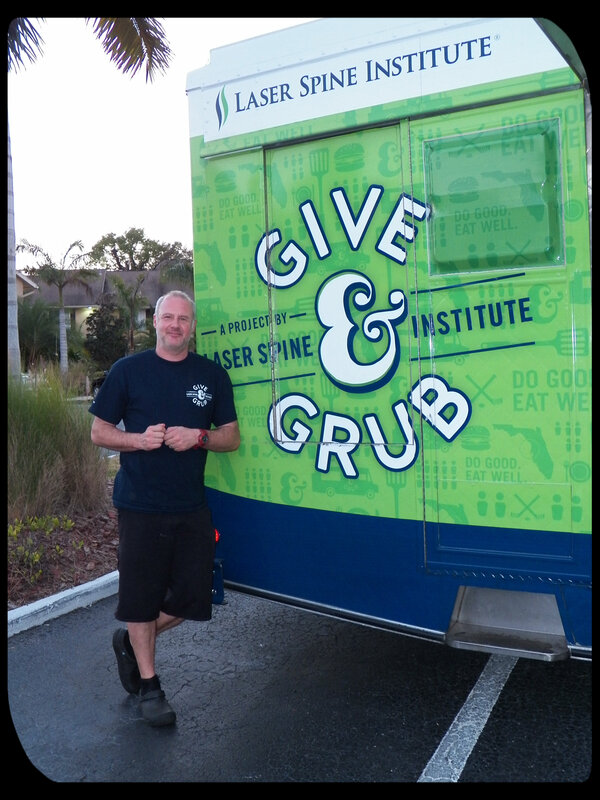 The Give & Grub Food Truck program was founded October 2014 by The Laser Spine Institute and the Tampa Bay Lightning as a project to “Stick It to Hunger”. This charitable initiative is aimed at reducing food insecurity for children in the Tampa Bay area. Did you know that 700,000 people go hungry every day in the Tampa Bay area? I didn’t. And of those, 250,000 are children. CHILDREN! I couldn’t believe the jaw-dropping numbers! 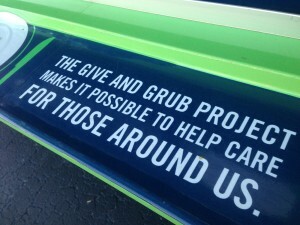 That’s what intrigued me about this philanthropic partnership and their Food Truck with a purpose. Every penny raised through meals purchased at the food truck goes straight to a fund for Metropolitan Ministries and Feeding America to feed children in the Tampa Bay area. What’s really cool is that in actuality, it’s the people in community that are funding this project. For every meal that’s purchased, one meal is donated to a hungry child. Plus, if you use the hashtag #GiveandGrub on social media channels (Twitter, Facebook, Instagram), an additional meal is donated through partnerships with Metropolitan Ministries and Feeding America Tampa Bay! How easy is that? 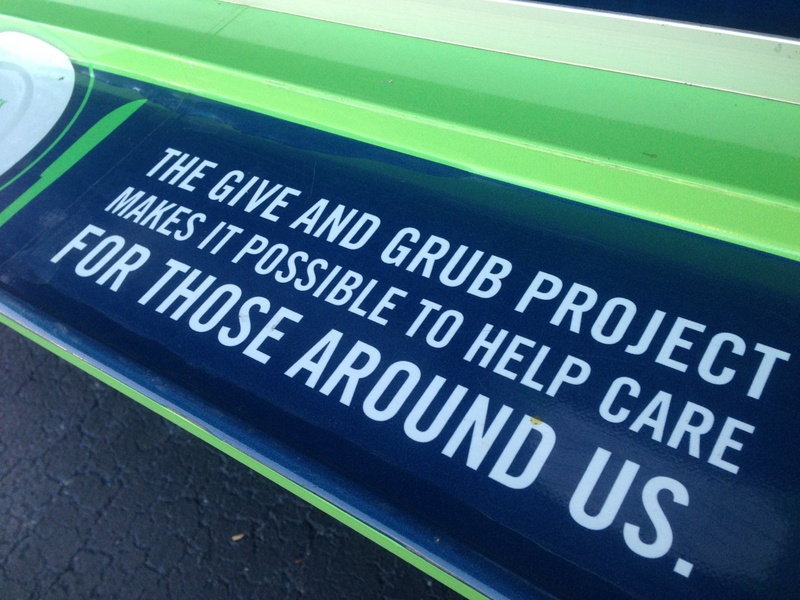 In March 2015, Give & Grub surpassed an extraordinary milestone with 25,000 meals donated! Isn’t that amazing? ShoutOUTs to Give & Grub, Laser Spine and the Tampa Bay Lightning! 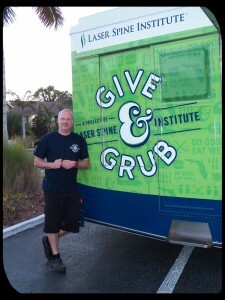 I had the opportunity to chat with Chef Bryan Goodell of the Give & Grub Food Truck and asked how the menu is decided. 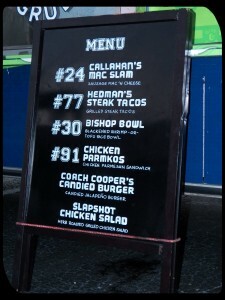 The menu is actually chosen by the Tampa Bay Lightning players based upon foods they personally love. 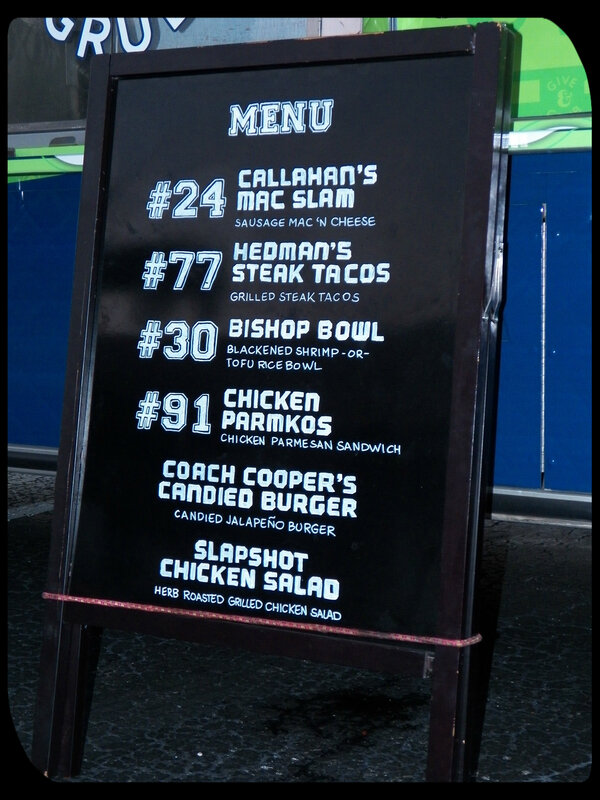 You’ll find scrumptious offerings such as Cooper’s Candied Burger named after Coach Jon Cooper, Bishop’s Bowl for goaltender Ben Bishop, or Callahan’s Mac Slam, for Right Winger Ryan Callahan. And recently, two new items were added to the menu. The Thunder Steak Sandwich (a Philly cheese steak-like sandwich with smoked Gouda), and cross-cut sweet potato fries with a marshmallow and butterscotch drizzle for that sweet/salty fix. It was difficult to choose, but here are just two of my personal faves: First, the Cooper’s Candied Burger – a juicy hamburger crested with roasted peppers, candied jalapenos, cotija cheese, and nuzzled into a Bavarian bun. 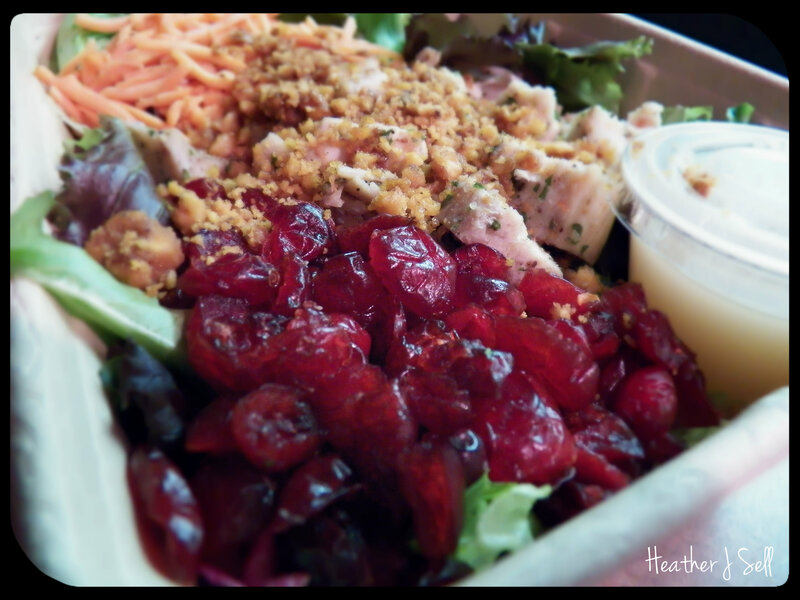 Second, the Slapshot Chicken Salad crowned with herb-roasted chicken, cranberries, roasted beets, sugared walnuts, on a bed of baby greens paired with a zingy Fuji Apple vinaigrette. and go snag lunch or dinner. Remember, for every meal purchased another meal is donated to a hungry child. Another easy way, get on social media and get hash-tagging. Every time you use hashtag #GiveandGrub an extra meal is donated and secured through partnerships with Feeding America Tampa Bay and Metropolitan Ministries. 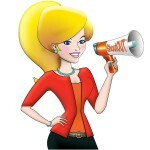 You can also invite the food truck out to your office, apartment complex or event. A special thanks to Chef Bryan Goodell for sharing his time, his passion, and a behind-the-scenes look into Give & Grub and the “Stick it to Hunger” project. Thank you Edelman PR for all the fantastic information and coordination. And last but not least, huge ShoutOUTs to Laser Spine Institute & the Tampa Bay Lightning for giving back so generously to the community and more importantly, to our children. In addition to the Give & Grub Food Truck project, the Laser Spine Institute is also actively involved in other outreach programs. They help secure and distribute meals weekly through Feeding America Tampa Bay to children at schools in Hillsborough and Pinellas Counties, as well as participate in the Weekend Backpack project providing a backpack filled with 5 nutritious meals for kids to eat over the weekend. They are also involved with Tampa Bay Girls & Boys Clubs on a monthly basis. Truly impressive! Keep up the amazing work! **Disclaimer: I was given a couple of meals in exchange for sharing my experiences, however, all views and opinions are completely my own. Discover. Share. Connect. Want to connect with us? This entry was posted in Blog, To Eat and tagged Boys and Girls Clubs, Edelman PR, Feeding America Tampa Bay, food, Give & Grub, Laser Spine Institute, Metropolitan Ministries, stick it to hunger, Tampa Bay Lightning. Bookmark the permalink. One Response to How about a Thunder Steak Sandwich or a Cooper’s Candied Burger? Pingback: Give & Grub Food Truck | ShoutOUT Enterprises, Inc.